Four second half Llandovery Try’s saw off Brynley Toms and his Bedwas teammates who gave a valiant effort ‘til the end but went down 38 - 17. Both sides took time to settle in the first half but the home side put the first points on the board via No.8 Emyr Price; Jack Maynard adding the extras. Bedwas responded almost immediately via the boot of debutant Evan Lloyd after the home side conceded a penalty. 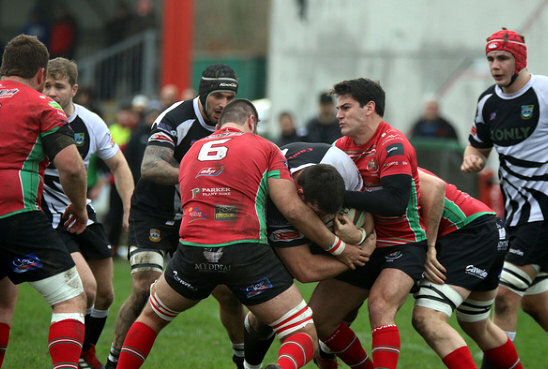 Both sides continued to defend well and no further scores came for the remainder of the half 10 minutes of which Bedwas spent with fourteen men as Adam Williams was sinbinned for deliberate off-side. Llandovery increased their lead two minutes after the break. Replacement prop forward Dino Dallavalle who had only been on the pitch for a minute barged over the line; Maynard again added the conversion. Once again Bedwas quickly responded as winger Jordan Rees crossed for try converted by Lloyd. Maynard added a penalty goal before two tries in three minutes from inside center Rhodri Jones both converted by Maynard earned the home side a bonus point. Bedwas continued to work hard in both attack and defense and after a period of pressure Jonathan Owen Davies crashed over the line next to the upright. Joe Scrivens quickly added the conversion to spur hopes that maybe a losing bonus point was a possibility. It was not to be however, as replacement Scott Maynard went over for a late converted try quickly followed by the final whistle putting an end to proceedings.